Material:made of stainless steel.Hypoallergenic and safe for your skin. it doesn't rust, change color or tarnish. SIZE- lenght 3.8cm(1.49inch)-4 cm(1.57 inch),width 2.5cm(0.98inch)-2.8cm(1.10 inch). You are purchasing a couples keychain set in Stainless Steel. Each keychain is stamped with your choice of "his one her only" or "her one his only. "A sweet couples set that is both simple and meaningful, One piece is not complete without the other! This keychains for a special occasion. Perfect for gift giving and so unique! 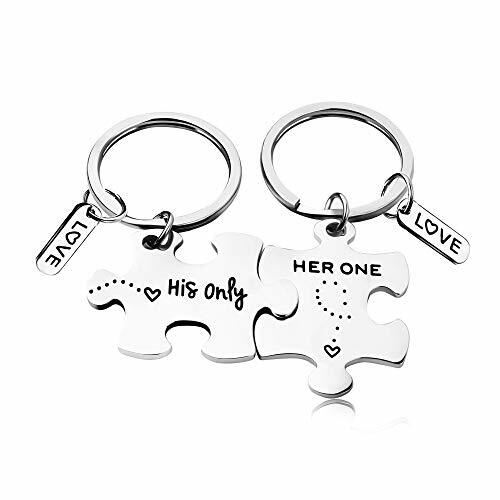 Set of 2 key chains come with hand stamped with "His One"and another stamped with "Her Only" Perfect gift for any couple of any age. Great anniversary, wedding gift or even a gift for a military couple or deployed loved one. We stand behind all of our products and will resend any item received damaged We provide a 90-day no-risk refund service, please feel free to contact us if you need more assistance -a happy customer is our main goal .